Delphinidin is an anthocyanin and plant-based nutrient that helps lend certain fruits, vegetables, and flowers their colors. It was first discovered in 1938 by Hungarian biochemist Albert Szent-Györgyi, who believed that delphinidin and other flavonoids were essential vitamins. Though this has since been found to be incorrect, delphinidin is still a helpful nutrient that can benefit an individual’s overall health. 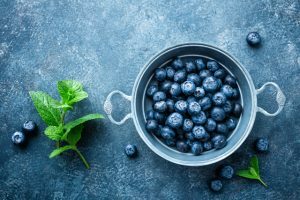 While present in a variety of fruits, vegetables, and flowers, the best sources of delphinidin are maqui berries, bilberries, black beans, and eggplants. Delphinidin is a potent antioxidant, meaning it can defend the body from oxidative damage by neutralizing and eliminating free radicals. These are harmful atoms that can make the body more prone to catching and developing chronic disease. Moreover, delphinidin has been shown to posses anti-inflammatory qualities as well, and as such, it can be used to prevent health ailments that result from and worsen due to inflammation. Thanks to its powerful anti-inflammatory qualities, delphinidin can prevent atherosclerosis, a heart condition that results from plaque hardening around the artery wills and limiting blood flow. Delphinidin is thought to obstruct cancer cell growth by impeding the production of blood vessels that feed cancerous cells. Along with other polyphenols, delphinidin can protect the skin from ultraviolet (UV) damage thanks to its photoprotective effects. Skin that has been exposed to high amounts of UV rays is more likely to suffer from skin inflammation and skin cancer, so delphinidin can help halt these conditions. Delphinidin is a potent antioxidant and anti-inflammatory agent that can lower the chances of developing certain disease like atherosclerosis. In addition, delphinidin can prevent UV rays from damaging the skin.